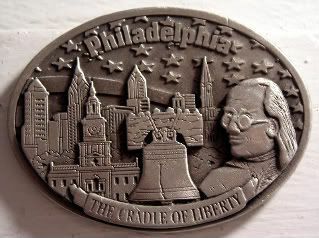 Today, in 1792, Congress authorized the first U.S. Mint, in Philadelphia. A few years ago, while in town for a client-related trade show, I did one of my signature whirlwind tours, where you cram as much as you possibly can into as little time as possible. Or, almost every item on this magnet. I took the train down in the morning, and by the time we met the clients for drinks and dinner, I'd already walked from the Convention Center down to the Independence Mall, done the tour at Independence Hall, visited the Liberty Bell in its new digs, visited the Independence Visitor Center, sniffled at the National Constitution Center, and visited the U.S. Mint visitors exhibit...as well as scoring the Oregon quarter from their nifty little vending machine. It's what I do. It's who I am. Hey, it's better than when I used to just make people drive by the Liberty Bell and peer at it through (sometimes) rolled down windows. Although, classic me - I must needs go back to visit, because apparently, I missed Ben Franklin's grave! Oooh, sorry for you. You shoulda come to Philly when I was there for the summer. Julie and I did it all too. Though that was before the Constitution Center.